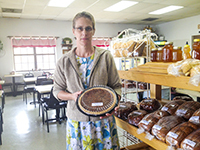 Sheila Decker holds a customer holiday favorite, pecan pie. Three years ago, she and her husband, Les, bought Ole Country Bakery, which has operated in Brooksville since 1981. “Pat-a-cake, pat-a-cake, baker’s man.” Or, let Ole Country Bakery do it for you. Located in Brooksville, Ole Country Bakery has everything from pastries to pies, all homemade and preservative free. For upcoming holiday celebrations and food fellowships, the bakery provides a good source for breads and sweet treats on the Thanksgiving or Christmas menus. Sheila Decker and her husband, Les, moved to Brooksville from Kansas three years ago and bought the bakery, which has operated since 1981. Decker had learned about Ole Country Bakery from her sister, who lived in the area. Although the bakery is owned by Mennonites and employs many Mennonites, Decker said that their preservative-free food preparation is not associated with religion. “It’s personal preference. Food tastes better without preservatives,” she said. Everything is made fresh daily. The main baker arrives at 3:30 a.m. to start the day’s dough making. Other kitchen crews come in at 4 a.m. and at 5 a.m. The store opens for business at 6 a.m.
Breakfast breads, pastries and muffins are popular. For lunch the deli-counter offers meats like ham or turkey dressed with lettuce, tomato and other fixings and served on the bakery’s homemade bread. The dining area seats 40 people. The Amish Friendship bread is the most-purchased sweet bread. Decker doesn’t know precisely how many she sells but said, “it’s hundreds in a week’s time.” Apple pies and pecan pies are also top sellers. Business significantly increases during Thanksgiving and Christmas seasons. Customers purchase pies, homemade rolls and other feast items for family celebrations, office parties and as gifts. “We have two shifts of bakers during holiday seasons. Our ovens literally run day and night,” she said. Ole Country Bakery also pays attention to college football schedules and knows to expect higher traffic volumes when Ole Miss and Mississippi State University have home football games. The bakery sits in a prime location to draw customers travelling from southern Mississippi to both schools’ campuses. Its fresh-baked goods add lots of flavor to football tailgating parties. Other customers include travelers headed south to the Gulf Coast and locals who live or farm in the Brooksville area. Ole Country Bakery also bakes cakes and takes special orders. Because the bakery doesn’t use preservatives, its items are healthier but have a shorter shelf life. Decker said that any item that does not sell by the end of the day is put in the freezer and sold at a discounted price the following day. After day two, anything remaining is thrown away. “We never throw away much at all. We only bake what we believe will sell, and any leftover bread is used to make bread sticks or croutons,” she said. She also uses leftover bread for bread pudding, another popular item among customers. Pies are $12.49 and the Amish Friendship bread costs $5.49. The bakery is located on a frontage road facing U.S. Highway 45 in Brooksville. 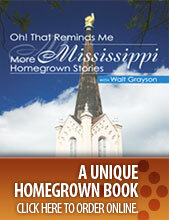 The tiny town is nine miles north of Macon, 26 miles southeast of Starkville and 110 miles southeast of Oxford. Operating hours are 6 a.m. until 5 p.m. Monday through Friday and 6 a.m. until 2 p.m. Saturday. To place an order call 662-738-5795. Thanksgiving and Christmas orders will be cut off a few days in advance of those holiday dates. Writer Nancy Jo Maples can be reached at 188 Ernest Pipkins Road, Lucedale, MS 39452 or nancyjomaples@aol.com.